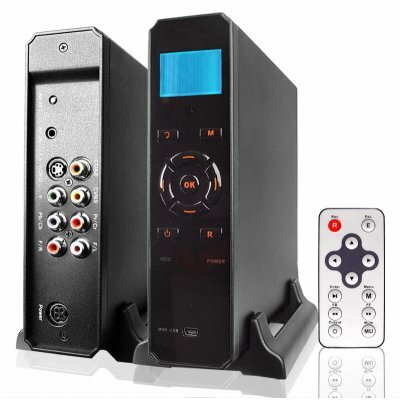 Successfully Added IDE Multimedia Center HDD Player - AV Output + Input to your Shopping Cart. Multimedia center HDD player with the ability to use up to a 500GB IDE PC hard disk for massive storage capacity, and with both AV OUT for connecting to TVs and AV IN for recording directly to the hard disk. This all in one hard disk media center is the perfect choice for making all your files on the computer portable and playing them on your TV at your leisure. With both S Video and YPbPr OUT, you can connect to all sorts of TVs, and with the AV IN, schedule your recordings at 320x240 pixels at 25fps in AVI format. Definitely a great PC accessory for anyone and a high profit return for any purchaser, with no MOQ direct from China. Note: This product is not sold with a Hard Disk included. You will need to purchase a hard disk separately. Also please remember to format your Hard disk to the HDD enclosure, or they will not work together..